Unbelievably, Alun and I recently celebrated 10 years together. 10 years. That's a whole decade. A decade seems like a really long time, but it doesn't feel like it. The past decade has brought us a lot - laughter, adventures, joy and love. I can't wait for the next decade. We didn't really know what to do to celebrate - we were both incredibly busy with work and had no time to spare for an evening out. So we settled on a lovely home-cooked meal instead. We turned to a recipe we found last year - one that is so easy, but so delicious! Adapted from Delia's recipe for Waitrose. The version I make tends to be larger than Delia's, mainly because of the size of the pork fillets, which always seem to be larger than the 250g Delia recommends. So the recipe below is based on the quantities I tend to use when making this meal. Cover a rolling pin with cling film and flatten each of the pork pieces a little. Lay all of your pork pieces out and season lightly with some salt and pepper. On top of each slice, place a piece of prosciutto. Be sure to fold the prosciutto so that it sits on top of the pork nicely. 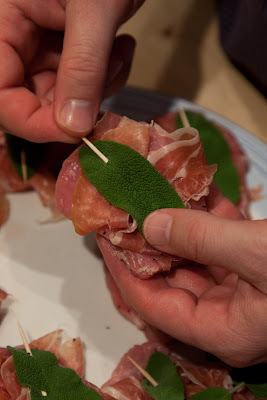 On top of the prosciutto, now place a large sage leaf. If you only have smaller leaves, you can use two or three. Secure the leaves with cocktail sticks. Pop some olive oil into your pan and turn on the heat (medium). While the pan is heating, flour both sides of the pork pieces. 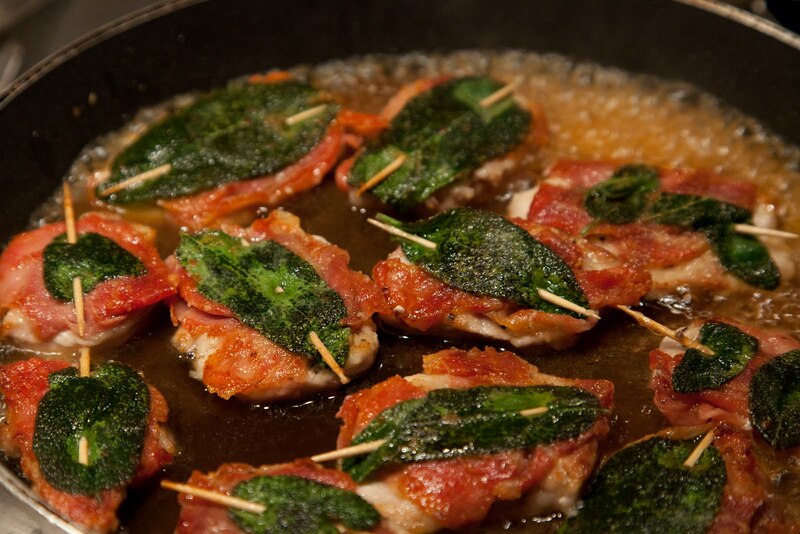 Place all of the pork into the pan, with the sage-side down. Leave to fry for a couple of minutes. Turn the slices over and leave for another minute. Pour in the marsala and turn up the heat, allowing the sauce to bubble. Leave the sauce to bubble away for a few minutes, until it becomes syrupy. Remove the cocktail stick from each piece of pork (be careful, they will be hot!) and place on the plates. Pour the sauce over the pork and serve with some mashed potato and steamed broccoli (to soak up all that lovely sauce). 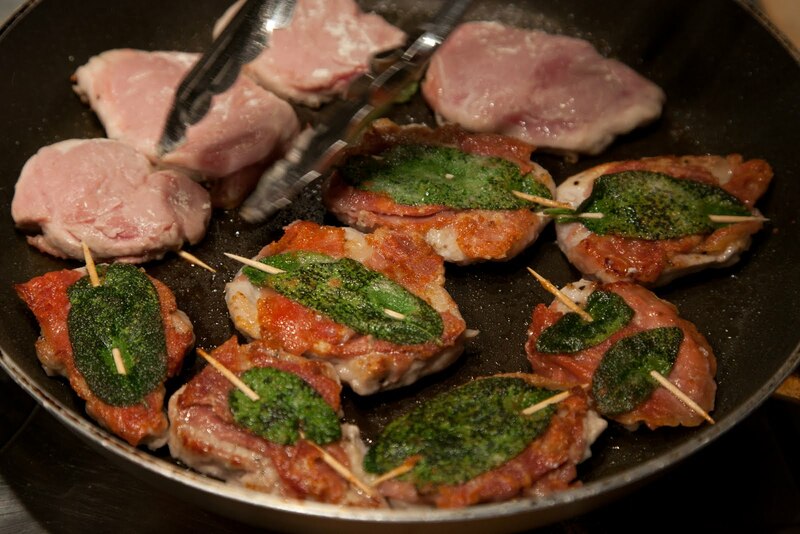 Tip: If you have too much pork for one meal, you can prepare everything as above, but stop before flouring the pork. Only flour and cook the pieces that you want, adjusting the amount of marsala accordingly. The remaining pork should keep in the fridge for you to cook the following night. Yum! One of my fav's - my dad used to make this quite often when I was growing up, but with Veal. And you see this on restaurant menu's in Italy a.LOT!